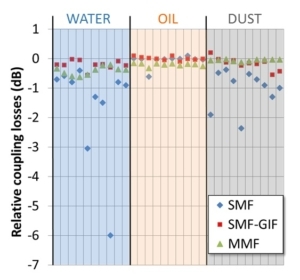 IDIL Fibres Optiques has developed a new high power connector technology called expanded beam fiber optic connector. 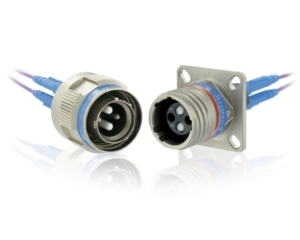 These connectors are based on graded index expanded beam micro lenses. 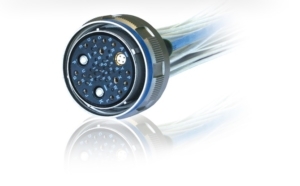 While industry is asking for more power handling optics, IDIL answers perfectly by providing expanded beam fiber optic connectors which enlarge beam waist and reduce power density at the plug connection. By welding single mode fiber and the right length of graded index fiber, these connectors allow high power handling capacity and low insertion losses. Moreover, their small size and the high contamination tolerance make them very useful in a large spectrum of applications. Our single mode graded index expanded beam connectors are resistant to water, dust and oil. These connectors are available in FC, SC, ST, LC, E-2000, SMA and also PM. 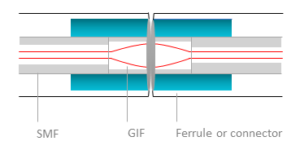 These high power connectors use graded index fiber on one mating end (connector 1) to collimate and expand the light beam on the connector 2 which refocus the light back into the fiber core. 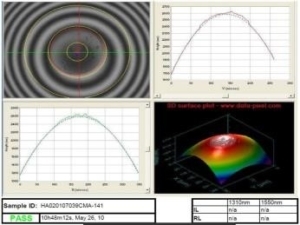 Beam waist is typically about 60 µm at the extremity of the graded index fiber. However, depending on your application, it can be easily increased by using bigger fibers and ferrules.